Greens MP Adam Bandt, and his wife Claudia Perkins, welcomed their first child in late June and named their daughter Wren. Adam contested the seat of Melbourne in 2007, and was the most successful candidate from a minor party contesting a seat in the lower house, losing only very narrowly to Labor. He was elected to the seat in 2010, the first Australian Greens MP to be elected during a general election, and re-elected in 2013. Prior to his election, Adam was a lawyer in industrial and labour relations, and often wrote articles on legal issues. Claudia is a former staffer for the Labor Party. (Wren’s name was announced as Wren Perkins: I’m not completely sure whether Perkins is Wren’s middle name or whether she has her mother’s surname. I’m putting it as her surname, mostly because Wren Bandt doesn’t sound right). 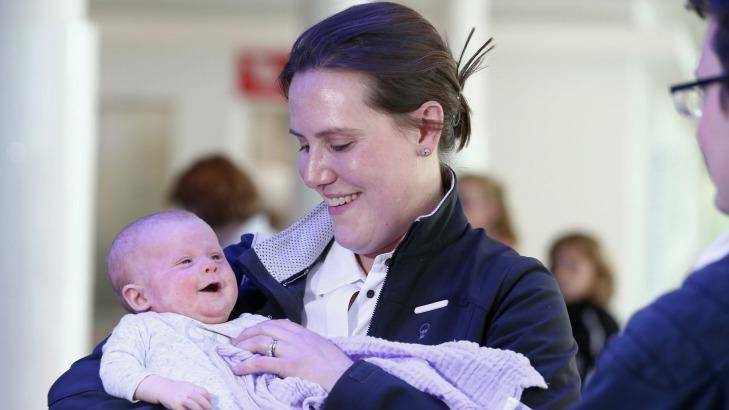 Liberal MP Kelly O’Dwyer, and her husband Jon Mant, welcomed their first child in late May and named their daughter Olivia [pictured]. Kelly became the member for Higgins in 2009, and is the first woman to gain Liberal Party preselection for a safe seat in metropolitan Melbourne. Before entering politics Kelly was a solicitor and bank executive, and was appointed Parliamentary Secretary to the Treasurer last year. Jon is an executive director at financial services company UBS.